The Ryoken (Clan designation Storm Crow) is a wide-spread, second generation OmniMech fielded by many Clans. However, within the Clan Smoke Jaguar touman, the Storm Crow was especially common during the Clan Invasion and was codenamed the Ryoken by the warriors of the DCMS who encountered it. Because of its versatility through its combination of mobility, armor, and firepower in its various configurations, the Storm Crow is a feared opponent on the battlefield. Bringing a bevy of lasers to bear on Innersphere enemies, the Ryoken Prime is a powerful long-range attacker, using its high speed to maintain range from opponents while striking them with maximum pin-point damage using two CERLBLs and 3 CERMBLs. 10 double heat sinks allow a decent volume of long range accurate fire aided by eoptics. This unit's selling points are it's independence of ammo resupply in the first place and devastating pinpoint accuracy across any engagement distance. The Ryoken A is a powerful close-range brawler, quickly wittling away at enemy armor with four Clan medium pulse lasers, while a dual SRM6 allows a powerful blow to damaged components. A single CLRM10 allows some opening volleys while the A variant closes in on opponents, and GECM keeps its presence hidden from enemy radars while it moves in for the kill. The pilot intending to brawl in this unit should have in mind that the Long Range Missiles while quite useful at opening shots, will come in handy to both close quarter hits and finishing blows to an enemy attending to "live and tell". In either case the spare ammo bins are best to be filled with spare rations for the ever hungry Short Range Missiles Launcher. Simple and to-the-point, the Ryoken B offers pilots a devastating CUAC20 fed by a single ton of ammo to pummel opponents of all sizes into submission in short order. This is backed up by three CERMBL which allow the B variant to get shots in before the massive cannon comes into play. 4 DHS can manage the autocannon's heat, but pilots have to be careful of the heat spike its lasers generate. 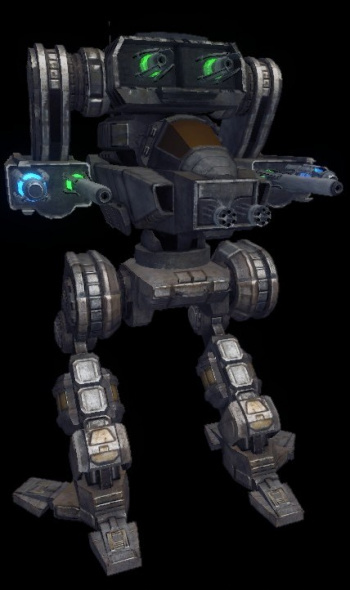 At all costs, Mechwarriors must shield the autocannon from as much return fire as possible by torso twisting the vulnerable arm away from enemies. Using terrain or even other friendly mechs as cover while closing the distance to its prey can be the decisive tactical move to unleash the Ryoken B's full potential. 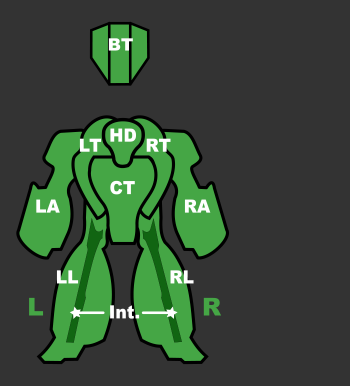 The C variant is apparently best suited as a mid-range support Mech, relying on its dual ATM9s to cripple opponents and keeping out of brawling range with its speed. A pair of cERMBL and a quad array of cERSBL for point defense complete the loadout with additional firepower, though pilots should take care not to overburden the few heatsinks this variant carries. Once a Mechwarrior realizes that each cERSBL dishes out just as much damage over time as a standard MBL and that it's single full burn is only mere 1/8 weaker in armor down-whittling, the battery of four just doesn't look so weak anymore. The cERMBL are obviously to be sparingly used when the mighty ATM9 pair is taxing the unit's mere 3 Double Heatsinks. Try not forget to buy reloads! cHLL will tax the most on it's 7 DHS but it is twice as damage efficient than the twice cooler to shoot cERPPC, which will just the same yield a shot about seven times in a minute as well. The dreading two ATM6 (HE) are to be fired in succession and they just might be ready in between the fore mentioned two weapons - or even more often so (9 shots/min each!) for half the heath of each cERPPC's jolt. A scalpel (HLL) a shovel (cERPPC) and two sacks of gravel (ATM6 pair)- quite a tool chest for the savvy warrior to pick from - pinpoint a weak spot, deny damage spreading or outright bombarding the target into shreds. Not for the faint of heart, or those who are still mastering their firing discipline. Comes equipped with a B-Pod should a stray Battle Armor or infantry platoon wade beneath your feet. A jack of all trades at a discount price, the Ryoken E is not a real heavy hitter compared to the other variants. Instead, it relies on its speed to selectively enter and exit engagements at will. At 700m out, a pair of cERMBLs accurately pokes holes at its targets while the LBX10 peppers enemies, its shots getting more and more focused as the enemy enters into close range only to get pounded by a pair of fast firing cSSRM4s with an effective range of 350m. Its 2 DHS can manage the heat of its energy weapons and cool autocannon at mid range, but the extra heat generated by firing its missiles, hurts the Ryoken E's sustainability in close range engagements. Still, they are unavoidable for pilots who want to maximize the asset's already stretched thin damage potential, although care must be taken to soften specialized close ranged enemies at distance before charging in, and even with 2 Free tons ammo runs after every few engagements are to be expected if the user doesn't want to be left dry in the middle of a firefight. The B-Pod this variant equips will damage nearby units if fired, up to 15 meters afar, including any stray Battle Armor or infantry squad. The Ryoken F is equipped for extreme range engagements with EOptics and anti-air missile strikes. Its main weapon is a pair of Extended Range ATM12, reaching out to 1250m against targets in the air or the ground with speedy and manoeuvrable missiles. A weak munition compared to other ATM loads, the barrage of 24 missiles is the largest any unit is capable of and more than makes up for it. Its point defence of four cSPL is paltry compared to its main weapon, but adequate considering the Ryoken's natural agility and armor. Unfortunately the large size of the missile launchers makes them ammo hungry and an extra Free ton for each won't last them long while a single DHS will force pilots to take breaks to cool down after a few strikes. This is a story of synergy, disparate leading and a case of IS-like loadout on and otherwise signature Clan mech and Clan Tech. The cERLBL and cGauss could live in a happy marriage where they only shot at slow targets up to 900m out. But as the current state of affairs has it, they will be most likely used against nearby flying or fast moving targets and such, so those two will have to be dispensed in separate shots. While the Gauss will require some leading and yields quite a punch, the Large Laser will deliver about half the damage requiring no lead bit still demanding to follow the target for the while of the full burn. The two feeble yet trusty Clan LRM5 will not only reliably home in to locked on targets, but provide valuable fire support up to the hugging distance due to not only lacking security fuse lock for minimal distances but also missing the ballistic lobe their Inner Sphere counterparts use to deny terrain obstacles to a great degree. Should all else fail, there is the additional cERMBL adding not only insult to injury, but doing so at avid 700m out, effectively reaching into long range to augment the only other laser for targets that are trying to threaten this unit with skirmisher warfare. Selling point? That's a tough one, but no other Ryoken we can think of has a Gauss, so there goes that. The Ryoken ‘Mech stands as one of the longest “in-development” assets for MWLL, having been in some form or other of development, re-development and being passed amongst at least 4 different developers over the past 2+ years. The Ryoken was released with 0.6.0. The Ryoken was originally designed by Clan Hell's Horses, but Clan Ghost Bear conquered the planet on which the Ryoken was developed. The Stormcrow is a wide-spread, second generation OmniMech fielded by many Clans. However, within the Clan Smoke Jaguar touman, the Stormcrow was especially common during the Clan Invasion and was codenamed the Ryoken(a misspelling of ryoken - hunting dog) by the warriors of the DCMS who encountered it. Because of its versatility through its combination of mobility, armor, and firepower in its various configurations, the Stormcrow is a feared opponent on the battlefield. Note: Despite the characteristic missile launchers on top of its hull, the standard variant of the Ryoken was armed only with lasers - three ER Medium Lasers and two Large Lasers. This page was last edited on 13 February 2019, at 01:36.